Tastes like a gooey caramel chew--sweet & salty but with the Prymal makeover. This best-selling flavor has been known to convert even those who claim to dislike caramel candy. Carissa C. Reviewed by Carissa C.
Love this product!! It’s my second favorite (and I’m usually not a caramel fan). It’s creamy, healthy, and convenient!! Dremessa D. Reviewed by Dremessa D.
I have been a long-time customer of Courtney and Primal for a very long time. 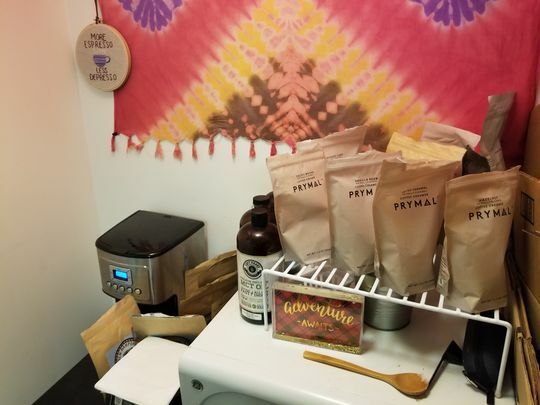 Her products are life-changing, delicious, super low glycemic / low sugar and make life so much easier in the morning during coffee. Coffee has been and will be one of the most important meals of the day for me. I used to use a ton of flavored creamer and put so much sugar and cream in my coffee. With this products, it sweetens, creams, and flavors all in one. It does the things I need it to do, to make me a happy girl in the morning. Courtney, I love you thank you. Salted Caramel is soo good! Salted caramel flavored Prymal is the BOMB! You can use it in hot or cold coffee- add a little HWC & a sprinkling of sea salt & it's heavenly! 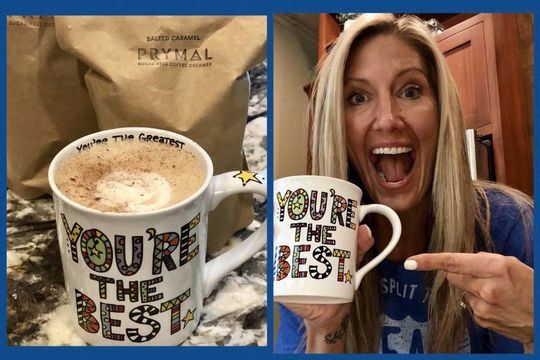 I put it in this mug as a message to Courtney- the creator of Prymal- to tell her "SHE'S THE BEST" for making these products for those of us who are coffee-creamer-addicts, but want to be healthy & NOT ingest artificial ingredients & lots of calories & sugar! (Do I know Courtney personally? No. But, I FEEL like I do- because she makes anyone who supports her product feel like family- & like she's creating these yummy flavors JUST for us!) I appreciate that & am so thankful I found Prymal!! Tracie E. Reviewed by Tracie E.
Salted Carmel is one of best creamers out there! I love the creaminess and the way its froths up. Makes my coffee ☕ taste amazing!